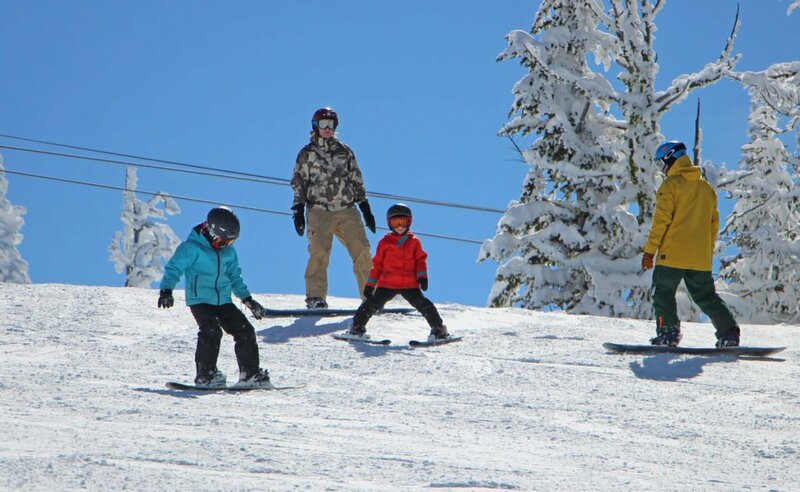 Bear Chair Lift Tickets and Rental Gear for a Family of Four (two adults, two children) – just $159 a day! Larger families can add additional children for $30 each. Available Starting January 6, 2019. Blackout dates: Jan. 13-14, Feb. 17-18. Please note: Easy Street (the beginner lift) lift tickets are free for everyone, every day of the 2017-18 season. This applies to both the Easy Street Triple Chair and the NEW Easy Rider Conveyor. The Bear Chair is Brundage Mountain’s mid-mountain chairlift which features access to 5 green (beginner) runs, 1 beginner terrain park with two lines of progression, 1 blue (intermediate) run and 3 black (advanced) runs. Looking for an instructor to set you on your way? We have special add-on options tailored to the Family Fun Pack user. $130 for a 90 minute Family Lesson for up to 4 family members. $15 for each additional person. Reservations recommended: 208-634-6631. View more lesson options here. If you’re looking to maximize your family time on the Best Snow in Idaho, a Family Season Pass is the way to go.